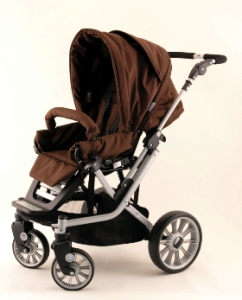 The latest stroller creating a ton of Buzz is the Teutonia. For over 60 years, Teutonia has been making strollers and nothing but strollers, and has become a leading stroller company in Germany and one of the top sellers throughout Europe. After becoming a part of the Newell Rubbermaid family of companies in 2007, Teutonia has branched out to cover the North American market so look for these strollers to start to hit a park near you. What makes this stroller so great? Unlike any other product on the market, the Teutonia stroller is FULLY customizable. Parents will have their choice of 3 chassis’, 3 seats with 9 colours, 3 floral choices, 15 accent fashions and 2 wheel types. In short, the chances of your stroller showing up at the same mall as you would be slim to none because it is fully customized by you. A couple things I like is the cool accessories that are available with this stroller. Northern moms will appreciate the fleece-lined t-handmuff. This cool extra will keep the driver’s hands stay warm and buried in a two-sided weatherproof shell. It snaps right onto the handle of every teutonia stroller chassis, ensuring warm, dry hands for mom, dad or whoever is pushing.